More than 1,000 tourists and survivors stranded by landslides have been evacuated from the small seaside town of Kaikoura since the quake struck on Monday. 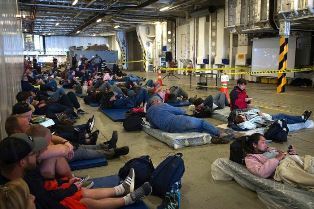 About 450 were taken by the New Zealand navy's multi-role vessel HMNZS Canterbury 150 kilometres south to Christchurch, the South Island's largest city. Most tourists had continued their journeys, but about 130 people were being housed temporarily in Canterbury University's student halls.